Central bank, beating Congress to the punch, issues rules to curtail banks' practice of automatically enrolling consumers in overdraft protection programs. 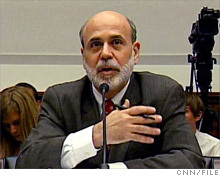 Fed chair Ben Bernanke releases new rule on overdraft fees. The economy has grown for five straight quarters, but there are signs that the recovery is still fragile. WASHINGTON (CNNMoney.com) -- The Federal Reserve on Thursday released a new rule to prohibit banks from automatically enrolling customers in overdraft protection programs, which charge fees when consumers spend more than they have. Starting on July 1, 2010, all banks will have to ask their customers to opt in to overdraft protection plans for ATM and most debit card transactions. Some banks charge as much as $39 when customers overdraw their bank account by even a few dollars. "The final overdraft rules represent an important step forward in consumer protection," Fed Chairman Ben Bernanke said in a statement. "Both new and existing account holders will be able to make informed decisions about whether to sign up for an overdraft service." Currently, more than 75% of banks automatically sign customers up for overdraft programs, according to a study by the Federal Deposit Insurance Corp. The new rule only affects overdraft fee services on ATM and one-time debit transactions. Banks will still be allowed to automatically enroll customers in overdraft services for personal checks and automatic transactions like monthly bill payments. Congress is also weighing action to clamp down on overdraft fees. On the legislative agenda are proposals to force banks to ask customers before they automatically enroll them in overdraft programs. The congressional bills are tougher than the Fed's rules. The Senate would empower banking regulators to set overdraft fees in a way that is "reasonable and proportional" and disclose to consumers details about how an overdraft charge was incurred and what can be done to fix an account balance on the same day the overdraft fee is charged. The House would cap the number of times banks can charge overdraft fees at three a year. It also would force banks to tell customers when an account is on the verge of being overdrawn, so they can decide whether a purchase is worth an overdraft fee. Yet, the current congressional proposals wouldn't go into effect until one year after passage, though they would prohibit banks from increasing overdraft fees in the wait time. The Fed has been under fire for not paying enough attention to consumer protection. Separate from the overdraft legislation, Congress is proposing to strip the Fed of its consumer protection duties and create a separate consumer agency. Lately the Fed has picked up the pace of its consumer protection activity. Last year, it approved a rule to rein in credit card fees, but Congress enacted credit card rules that will take effect in February before the Fed rules go into effect. On Thursday, Sen. Chris Dodd, D-Conn., and Rep. Carolyn Maloney, D-N.Y., generally praised the Fed's latest move. "This is a long-overdue announcement for American consumers," said Dodd, chairman of the Senate Banking Committee, which is set to hold a hearing on overdraft fees on Tuesday. Maloney called the rules a "good step forward" but added that Congress needed to press ahead. She said in a statement that the Fed rules still allow banks to charge an "unlimited quantity" of fees and "do nothing to make fees proportional to the amount of the overdraft." For banks, overdraft fees are a big revenue generator because so many people rely on debit cards. Some 75 out of 100 financial transactions are electronic, according to Moebs Services Inc., an economic research firm. The financial services industry is on track to make $38.5 billion this year on overdraft and non-sufficient fund fees, up 38% from $27.9 billion five years ago, Moebs estimates. The banking industry was not pleased by the Fed's move. "It radically changes and alters the overdraft services for consumers," said Scott Talbott, chief lobbyist for the Financial Services Roundtable. "The result will be confusion and embarrassment and frustration."